Reduce Ad Burn. Optimize Sooner. Increased Profits, Guaranteed. 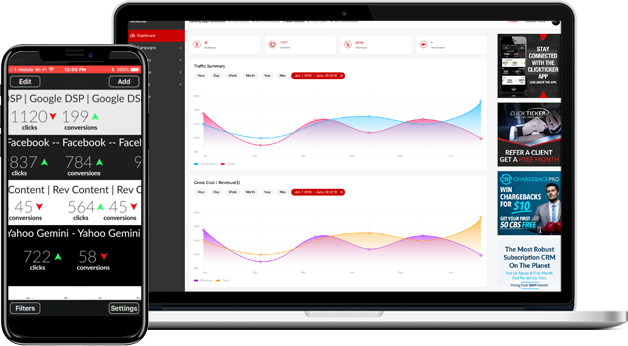 Introducing the most effective performance marketing app anywhere! Our app mimics similar platforms used by financial markets. Specifically built for people who care about every penny and want total real time transparency to investment behavior. Whether in a cab, boarding a plane, on a conference call, at lunch or using the restroom, our live streaming, fully customizable, data tracking and analytics app is constantly live streaming your customized critical data with our patented push driven analytics. How long does it take you to check your clicks, leads or sales right now? Are you required to "refresh" a report? Pull a new report? Is that data constantly accurate to the second? In a world where everything is real time, why is your ad spend delayed? Annualized, these delays cause gross campaign overspend. If your business strives to compete, then every second counts. Real time. All the time. Wall street does not wait for 'refreshes', logins, or data pulls and neither should you. ClickTicker™ utilizes proven, real-time, self-updating, patented, ticker technology to provide the critical data required on desktop, tablet or mobile devices. Financial markets stream live data to gauge real time performance and ROI. Thanks to ClickTicker™ you can, too. The business world knows no borders. If you service clients in various countries, our targeting feature will allow you to redirect users to the relevant destination pages based on geo-locale. Next generation reporting backed by perfectly efficient execution. ClickTicker.com is the only licensed distributor of us patent US 8,244,584 b1, relaying real time transparency to media buyers, everywhere. Knowledge is power. Use our knowledge and proven best of breed technology to empower your marketing campaigns. 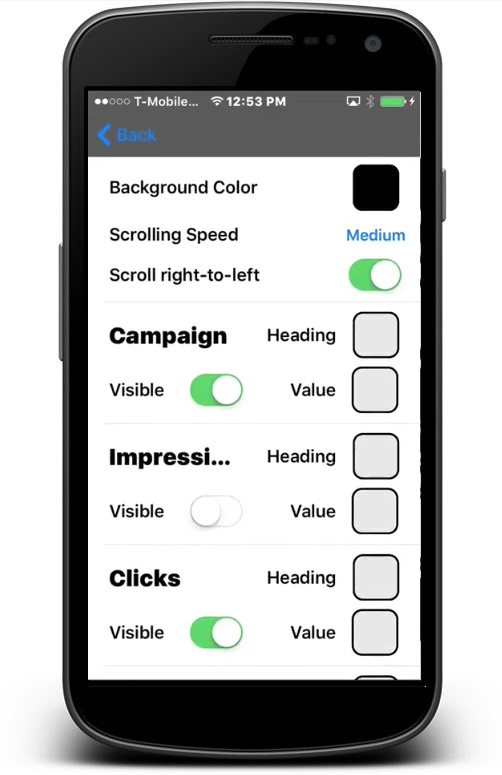 Team testing can skew campaign results, but not with ClickTicker™. Whitelisting your employees will ensure that their actions do not alter the campaign's true metrics. Stop wasting time deleting irrelevant test data and start focusing on real results. ClickTicker™ is one of only a few companies in the world to have our pixels and ad serving platform certified by the largest ad exchanges on the internet. ClickTicker.com has been analyzed and vetted by the biggest and deemed to be best of breed. What Is ClickTicker™ and What Do We Do? ClickTicker™ is the only ad serving / ad tracking / analytics platform with patented, self-updating, live streaming, reporting. ClickTicker™ has patented and implemented push analytics, revolutionizing a "pull" driven industry. Simply put, ClickTicker™ is the most comprehensive ad serving and analytics platform you will ever use. Contact us now to schedule your demo and reduce overspend with real time, streaming display and aggressive alerts. ClickTicker.com streams your critical ad-data, using state of the art, next generation, reporting technology, that is self-updating every second. Live, real-time, updates and alerts for the transparency you demand, naturally creating an environment of real time optimization. Simply put, reducing overspend maximizes profit. ClickTicker.com will enhance your bottom line from day 1 and reclassify your earning potential as limitless.